For those of us on a diet, whether it be low-carb, low-cal or gluten-free, giving up pasta can be very difficult. 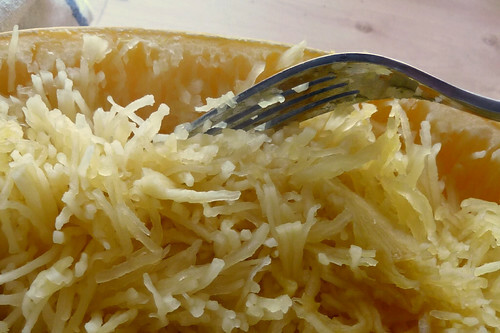 There is, however, an alternative: Spaghetti squash. 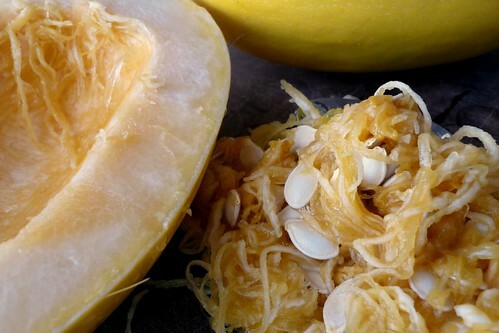 Spaghetti squash is an interesting variety of winter squash that forms strands once cooked and scraped. 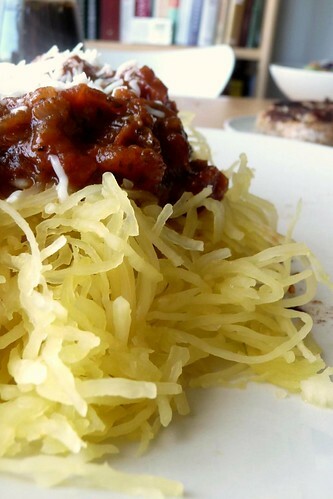 It’s low-calorie, about 75 calories per 8 ounces (cooked), plus it looks and acts just like spaghetti (but crispy!). To select a good squash, pick one that’s even in color, heavy for its size, with no soft spots or green. You can store it on the counter for about a month, but once it’s cut, use it within 2 or 3 days. A 4 pound squash will yield about 5 cups. You can steam, boil or bake this squash, even microwave it. To do this, halve the squash and scoop out the seeds, just like any other squash. Make sure your knife is sharp and it will go much easier because this squash is HARD! Discard the seeds and innards or keep the seeds to make Roasted Squash Seeds later. How you halve it determines the length of the strands. If you halve it from stem to blossom, like I did, the strands will be cut in half. If you halve it along its equator, you’ll get much longer strands. Microwaving: Place half a squash, cut side up, in a microwave-safe dish, add 1/4 cup of water and put it in the microwave. I like to sprinkle some salt on mine too. One half squash takes about 8 – 12 minutes on HIGH. Baking: Put the squash into a ovenproof dish, cut side down, add 1/2 cup of water, and bake for about 30 minutes at 350F/180C. (You can also do this with a whole squash!) Test it like a potato — if you can slide a fork in easily, it’s done. Boiling: Put the squash into a deep pot, cut side down, add 2 cups of water and bring to a boil. Boil for about 20 minutes. Test it as for baking. Take the squash out carefully, it’ll be hot. Now, with a large fork, gently scrape down the flesh of the squash. It will fall away in strands. Be careful of the steam and use a towel or mitt to hold the squash steady instead of your bare hand. Portion it out and toss it with your favorite sauce. You can serve this versatile squash as a side or a main, hot or cold. I like to have it as a main with lots of sauce, a side salad and sometimes a bit of chicken or garlic bread. If you want, you can freeze cooked squash is freezer bags and save it for later. Just defrost and steam for about 5 minutes. Cook squash via any method described. Let cool slightly. Rake flesh with a fork to create ribbons, toss with heated sauce in a large bowl. Portion out into pasta bowls, garnish with Parmesan and parsley to taste. Recommended accompaniments: Side salad, garlic bread, grilled chicken breast. In a saucepan, saute onion and garlic in olive oil over moderate heat. Add wine and simmer for 30 – 45 seconds. Stir in tomatoes, sauce and beef broth, followed by bay leaves and herbs. Simmer on low for about 3 hours2, adding additional water occasionally to keep it from burning or becoming too thick. Taste, adjust seasonings as necessary. We happened to have a can left from a case lot sale. You could also use two to three Roma tomatoes, diced and tossed with basil, oregano and thyme. The sauce can be eaten long before the 3 hours is up but it won’t have the depth of flavor that the long cooking process gives it. This entry was posted in american, dairy-free, gluten-free, recipes, sauce, side, untranslated, vegetable, vegetarian. Bookmark the permalink.